DiscoverOrg is the market-leading sales intelligence platform that enables sales and marketing professionals to accelerate growth by delivering a continuous stream of accurate and actionable company, contact, and buyer intelligence that can be used to find, connect with, and sell to prospects more effectively. Our team of 250+researchers deliver the most accurate company and contact profiles with 100% human-verified contact data. We are the only data provider that contractually guarantees 95% accuracy! Our mantra is “No Bad Data!” The key to meaningful engagement with prospects is actionable context. Our constant stream of proactive, actionable intelligence gives reps visibility and insights into developing opportunities ahead of the competition. DiscoverOrg has the deepest and broadest set of integrations in the sales & marketing industry–enabling your team to leverage our data in your everyday systems without introducing cumbersome processes or workflows. With DiscoverOrg, you’ll spend less time researching target accounts and more time speaking to buyers. Our customers make more calls, book more meetings, generate more pipeline and grow revenue 4X faster than the S&P 500. At DiscoverOrg, we believe growth starts with accurate and actionable data, but that’s just the beginning. We partner with our customers to provide ongoing support, training, and resources that ensure sustainable growth. With all this data, DiscoverOrg helps sales team reach out to new prospects to increase their sales. Thanks to data vizualization, sales representatives can even know where the prospect is located. They can make lists of prospects based on any criteria they want to contact them faster. Discover Org also tells sales representatives which software are their prospects already using, to help them make the best sales speech possible. I've been using DiscoverOrg with one of my consulting clients. Intelligence on our existing prospects and their companies using the Opps Alerts feature. Also, we were able to gather new prospects using that feature and the Advanced Search option. We were able to fill in some of the blanks in our Salesforce data, which was outdated to begin with. This product is a game changer. My only con was the issue with setting up and how long it took to get a unique bug to our Salesforce org fixed. If that had been a little faster, this would be a 10/10DiscoverOrg has a wealth of information at your fingertips. There are a lot of items you can filter and query by, so you can be as specific as you'd like. So far, the information has been accurate and they continue to innovate with new features for their customers to use. This has really allowed us to intelligently market and sell to our prospects. DiscoverOrg has a wealth of information at your fingertips. There are a lot of items you can filter and query by, so you can be as specific as you'd like. So far, the information has been accurate and they continue to innovate with new features for their customers to use. This has really allowed us to intelligently market and sell to our prospects. We had some trouble with connecting DiscoverOrg to Salesforce - there was a bug within the code and it took me a lot of time and effort to escalate my case through their support team. I am not a developer by any means, so I was unable to assist in solving the issue. Once we got it working (two weeks from buying the product) it has been great. Sales targets are achieved easily. Number of sales qualified leads and marketing qualified leads are increased and more deals are closed using DiscoverOrg. AMB campaigns delivered successfully. The best part about DiscoverOrg is if the company has 50 IT managers globally, it helps us to know who reports to whom and whom should we reach directly. It avoids the chain on calling various non related people. Direct contact numbers are available with the right email address which helps us to deliver successful email campaigns. The best part about DiscoverOrg is if the company has 50 IT managers globally, it helps us to know who reports to whom and whom should we reach directly. It avoids the chain on calling various non related people. Direct contact numbers are available with the right email address which helps us to deliver successful email campaigns. DiscoverOrg is a great prospecting tool for sellers looking to target a specific job role or function across a variety of companies. You will be able to get accurate contact info in order to run a sales campaign to a target audience.I really like the ability to create and pull contact lists through the website. It will quickly convert large contact lists into an excel document, which is helpful when running campaigns. The contact information tends to be updated frequently and usually is accurate. I really like the ability to create and pull contact lists through the website. It will quickly convert large contact lists into an excel document, which is helpful when running campaigns. The contact information tends to be updated frequently and usually is accurate. Some companies contact lists are fairly limited and higher level decision makers have their contact information repressed. Also some companies can not be found on the site so you don't always get what you are looking for. DiscoverOrg has been of extreme value for our company in general and our reps specifically. It has allowed our reps to quickly see the chain of command in the company they're looking at, which leads to a more strategic sales initiative. Being able to bring in technology data allows for better targeting efforts as well. Lastly, their Customer Support has been a positive experience as they are always on top of any tickets we submit and typically help us solve them immediately.Seeing company hierarchies and the ability for our reps to get email updates on any changes within the companies our reps are looking at. Seeing company hierarchies and the ability for our reps to get email updates on any changes within the companies our reps are looking at. If the lead that we are importing already exists in our system, it's difficult to see that combined with the imported ones in SFDC. This makes it difficult to add all desired leads into nurture campaigns. DiscoverOrg is a great tool to keep track of target accounts. Their information is very up to date and syncs into Salesforce very easily. They monitor trigger events (company moves, funding, new projects) and can notify you when one of your accounts is mentioned which is very useful. I don't have many cons about DiscoverOrg. It does what it needs to do and does it well. I guess one thing would be that the user interface could use a modern overhaul but that's it. DiscoverOrg provides organizational charts of many big companies, with names, titles & positions. This helps sales teams reach out to the right person & understand the company before trying to contact potential clients. The platform provides direct phone numbers that saves a lot of time when contacting prospects. All the data is updating with human verified data in real-time to make sure sales representatives don't waste any time with bad data. DiscoverOrg displays which technology each company is already using. The platform provides buyer intent data in a feature called OppAlerts indicating topics of current interest to companies and contacts. Below are some frequently asked questions for DiscoverOrg. Q. What type of pricing plans does DiscoverOrg offer? Q. 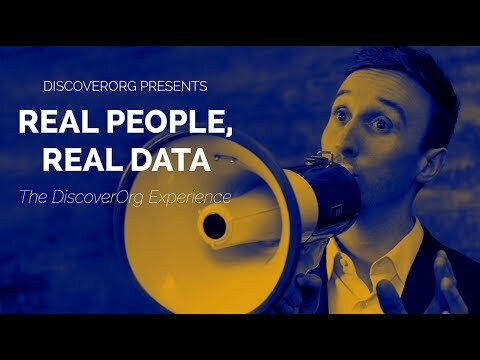 Who are the typical users of DiscoverOrg? Q. What languages does DiscoverOrg support? Q. Does DiscoverOrg support mobile devices? Q. Does DiscoverOrg offer an API? No, DiscoverOrg does not have an API available. Q. What other apps does DiscoverOrg integrate with? Q. What level of support does DiscoverOrg offer? Q. Which apps is DiscoverOrg compared to most often?